Online sales have ended. Purchase at the door. 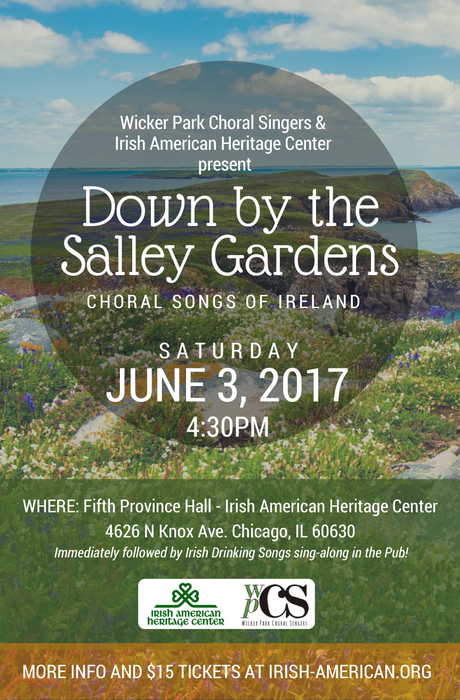 Wicker Park Choral Singers and the Irish American Heritage Center present Down By the Salley Gardens, a choral concert this June. The concert in the IAHC’s Fifth Province Pub features choral songs from Ireland. After the concert, guests can enjoy a post-show reception and sing-along of Irish drinking tunes, led by singer Kathy Cowan and Tenor and pianist Mark Piekarz. Wicker Park Choral Singers’ mission is to build community trough choral music. They have performed in spaces throughout the Chicagoland area, including Chicago Cultural Center, Fourth Presbyterian Church, St. Vincent de Paul Church, Millennium Park and the Humboldt Park Boathouse. Throughout the year, they perform a number of outreach performances and hold interactive workshops that are open to the public. Down By the Salley Gardens is Saturday, June 3 at 4:30pm. Tickets are $15 and can be purchased by clicking above or calling 773-282-7035, ext. 10.